Taco’s are always a favorite in our house. Great to serve for lunch, dinner or half-time. It doesn’t have to be Tuesday to enjoy a taco but at my house pizza is served on Friday and taco’s are served on Tuesday. When I was a working mom, many meals were planned around after school activities. Tuesday and Friday nights were always ‘free’ nights, meaning I didn’t have to drive the kids anywhere on those nights, so mealtime was easy. 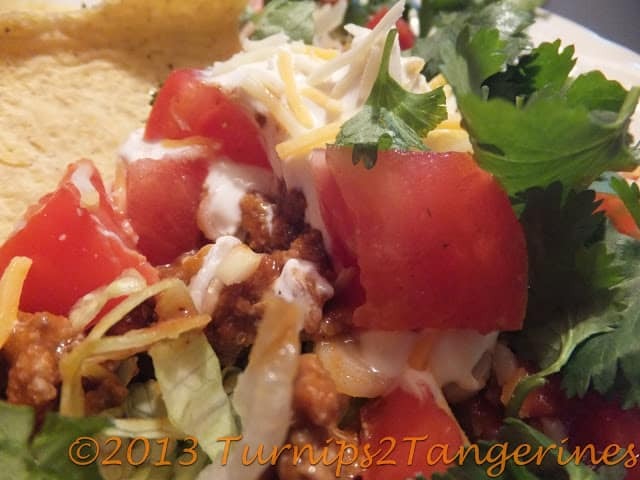 Taco meat can be made up ahead of time and then reheated or kept warm in a slow cooker. Shred lettuce yourself or buy big bags of pre-shredded lettuce. 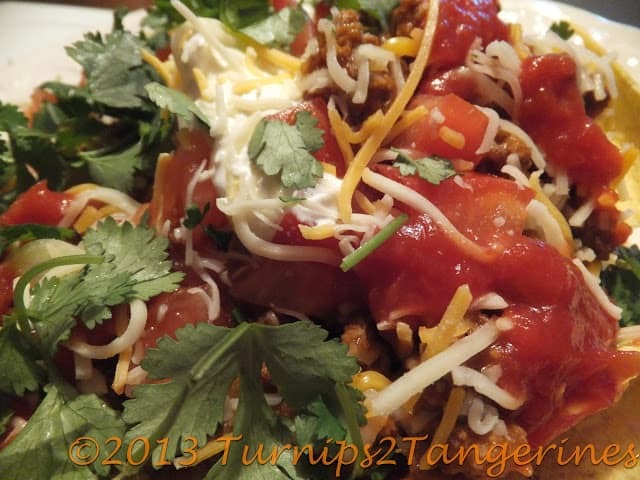 Chop tomatoes, onions, green peppers and any other taco toppings you want to serve, ahead of time. Divide the ingredients between store n’ serve plastic containers. The same goes for the cheese and salsa. Buy big bags of shredded cheese and large jars of salsa or taco sauce. Years ago when I was a young bride, way back in the late 70’s, I made tacos often. Back in the day, Tupperware Parties were the party to get invited too, along with Jaffra, Sarah Conventry and Home Interiors. I dreaded all parties but I liked Tupperware parties (the best food was always served at Tupperware parties) To this day I still use Tupperware and hunt it down fanatically whenever I go thrift shopping. At that time, Tupperware had a large round divided container that I loved to use and still use for tacos. I of course had three and they each had six or seven triangular sections and one small round section in the middle. It had the classic Tupperware cover, that you had to “burp.” Each section was filled with all of our favorite taco fixings, diced onions, tomatoes, black olives, jalapeno peppers, taco sauce, cheese, sour cream and guacamole. The next time you go thrift shopping, seek out one or two of these handy dandy Tupperware round sectioned servers. Taco making will become so much easier and kids get a kick out of making their own tacos with all the trimmings. 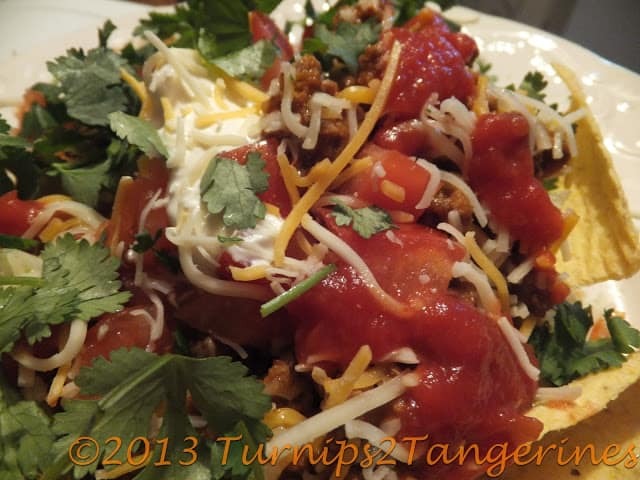 Tacos in Pasta Shells are great to serve instead of the more traditional taco. For more recipes, check out our Recipe Box. Products used in this recipe: Ortega. In my family we always serve Tacos on Tuesday but you can serve tacos any day of the week. Brown hamburger in a large skillet, drain. Add packet of seasoning mix and 2/3 water. Stir in refried beans, salsa and diced green chilies. Cook until bubbly and thickened. To assemble on plate: Place shredded lettuce on plate. Top with meat, tomatoes, green onion, shredded cheese, sour cream, taco sauce, avocados, black olives, hot peppers and cilantro. Serve with taco shells or tortilla chips. Yummy! Tacos are always a winner for dinner 🙂 thanks for stopping by my blog the other day—following you back!! hi, I found you through the blog hop – all of these beautiful photos are making me hungry!